Daniel Montgomery and Timothy Paul Jones. PROOF: Finding Freedom Through The Intoxicating Joy of Irresistible Grace. Grand Rapids, MI: Zondervan, 2014. 224 pp. $16.99. Grace. There are few words more cherished in the evangelical idiom. Step into our churches and you'll probably hear the word every Sunday. You'd even think the word would be seared into the American consciousness. I mean, everyone knows that God shed his grace on America, and who couldn't sing a few bars of “Amazing Grace”? And yet for all that familiarity, Daniel Montgomery and Timothy Paul Jones contend, most of us tend to live a graceless existence where performance and conditionality determine everything, threatening to thrust us into the cauldron of faith-killing despair. If we truly understood the beauty of the astonishing grace of the biblical gospel, it would make us stagger like drunken men intoxicated on the highest-proof spirits we could lay our hands on. In their pastoral, lively, and accessible book PROOF: Finding Freedom through the Intoxicating Joy of Irresistible Grace, they aim to get us tipsy by presenting us with a God who is sovereign, gracious, and mighty to save—far beyond the Cosmic Butler/Therapist of our imaginations. 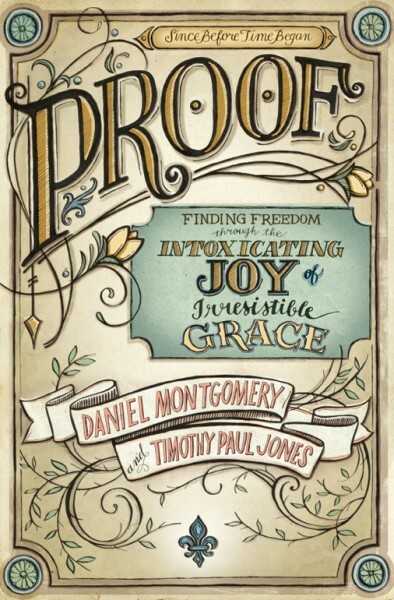 Not only is “proof” a chief metaphor for the intoxicating effects of grace, it's also an acronym that shapes the heart of the book. Essentially, it's a retooled and popularized exposition of the five major heads of the Canons of Dordt (more popularly known as the five points of Calvinism) with all the parsing of the Greek, post-Reformation developments, and modern discussions relegated to the extensive (40 pages!) endnotes. The acronym, then, is formulated to put the emphasis on a positive presentation of the doctrines of salvation, not a negative defense shaped in response to a challenge. In fact, in the final chapter Montgomery and Jones state their aim isn't to lead readers to embrace Calvinism as a system, but rather the depth of the truth of grace. To that extent, I think it does the job admirably. Which leads me to PROOF's many strengths. First, and most importantly, it's deeply biblical. Though they do have an appendix dedicated to “Proof-texts” (see what they did there? ), this isn't just a presentation of cherry-picked verses. No, in each chapter we're presented with a thread of theologically developed, long-range biblical themes such as covenant and atonement, or lengthy (though not excessively technical) expositions of specific chunks of Scripture. Indeed, at times the book feels like an extended meditation on Paul's letter to the Ephesians. Another laudable strength of PROOF is that it ground the doctrines of grace in the doctrine of God. Salvation is by grace because in God we don't have a Divine Butler but a Sovereign King who does what he wants. We don't simply have an affirming therapist who wants us to be happy but an adopting Father who is relentless in his gracious pursuit to bring wandering rebels home. Salvation is by grace because “salvation is of the Lord.” On page after page, Montgomery and Jones rip your eyes off of your own efforts and redirect them to a gracious God. Finally, Montgomery and Jones write with a consummately accessible and pastoral voice. While it's obvious from the 40 pages of endnotes that they did their homework, the emphasis is on the doxological value of these doctrines. Indeed, there were a couple moments when I legitimately teared up. As a theology nerd, I can say that doesn't happen too often. Abounding in dozens of preacherly images, metaphors, songs, and personal stories, these are truths meant to be transformatively applied to the lives of believers, not simply debated by professors. Grace is good news for real people with real struggles. Grace is assurance for the anxious. Grace is freedom for the addict. Grace is fuel for evangelism. Grace is the foundation beneath churches where the broken are healed, and the healed are sent out with the message of the gospel. Despite all of this, I do have a couple of comments of concern. The first is about a rather specific and unfortunate use of the phrase “camel-jockey” to refer to the patriarch Abraham (60). Maybe that's just a colloquialism in some parts of the country, but as a Christian of Arab descent who's been insulted with that term, I couldn't help but flinch at the use of the slur. Given the authors' robust defense of the racial universality of the gospel call, the offense was obviously unintended. Still, somebody in editing ought to have caught that phrase. My other (admittedly minor) comment is on chapter structure. In an effort to keep discussions accessible, key doctrinal definitions and discussions of certain objections are placed in sometimes lengthy sidebars. For the most part these are helpful. Still, when your bracket section reaches more than a page in length it becomes a bit clunky. Or when it involves defining something as crucial as atonement, it may be worth including it within the main body of the text. In their final chapter Montgomery and Jones end strong by issuing a full-throated call for our generation to fight for the gospel of grace. Beginning with a quick tour through Reformation history, they invite us to joyfully (and humbly!) take up the Reformation solas as our own battle cry against every tendency to obscure the gospel of grace. The point isn’t to create more prickly, argumentative Calvinists but to safeguard and proclaim the liberating news that I don’t have anything left to accomplish, achieve, or prove, because Jesus has done it all for me. To that call I can only give a hearty “Amen!” May we heed the wisdom in these pages and, more importantly, embrace this transforming grace for our own lives. In other words, drink up. Derek Rishmawy is a systematic theology PhD student at Trinity Evangelical Divinity School. He contributes to Christ and Pop Culture, Christianity Today, and writes at his own blog, Reformedish. He also co-hosts a podcast called Mere Fidelity. You can follow him on Twitter.